So! Book #1 of my summer reading list down. I’m quite proud of myself. The comments were full of people who absolutely loved Moonwalking with Einstein and predicted I would as well. Which means it’s hard for me to say that it wasn’t my favorite book. I liked it, but I didn’t love it. It’s not one I’d particularly recommend, frankly. The book is kind of two separate things. On the one hand, you have a bunch of history about memory – how ancient civilizations viewed memory, some of the well-known (and lesser-known) studies and tests of the human memory, people who either have lost their memories or have incredibly amazing memories, and basically all sorts of fascinating trivia and history about the human mind. I was fascinated by the concept of the OK plateau, where you subconsciously decide you are good enough at something and despite continued practice, you no longer improve (say, typing. Once you hit around 80 wpm or whatever, you don’t tend to get faster, even though you type probably every single day. Or driving. You don’t improve much after the first couple of years). I loved learning about how to blast through that plateau (although the answer is, to no one’s surprise, hard-work, failure, and focused practice. So, you know, no easy answer there). I think if this had been the whole book, I’d have really really enjoyed it. But. . .there was the other part. This was about the memory competitions that take place in the US and on the world stage. Foer covers it one year and is pretty amazed at the abilities of the competitors. But he’s even more amazed when every person he interviews tells him it’s not that they are more gifted than anyone else, it’s that they just have learned methods to remember things. He wonders if he can do it. So he sets off to try to learn the methods and see if they’re right. Which, in theory sounds pretty interesting. Except basically all the people he trains with are guys drinking themselves into oblivion every night and then doing high-level cramming. It’s people trying to make a killing off of some memory tricks. It’s training for a competition that, at the end of the day, seemed to me like one big party trick with people I didn’t find at all enjoyable to read about. Even after making it to the final rounds of the US championship, Foer admits that it’s still more convenient to use a post-it note to write things down and he can’t remember where he left his keys. He’s no better at remembering general kinds of things than an average person. The book weaves the two parts together which meant I would race through twenty-five pages and then slog through the next twenty-five page. Repeat for 300 pages. Now on to the next book, Ruby Red. I'm kind of relieved that you didn't LOVE it because I felt bad being the only unenthusiastic commenter who had read this book. I also felt like I didn't see the point at the end of the book. 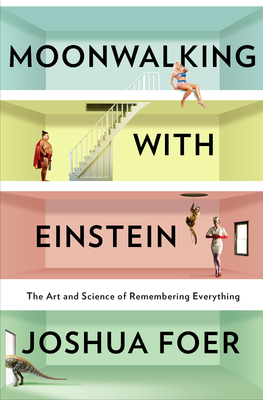 If we have so many methods of external memory, why bother building memory palaces? I would have like to have learned why it is that I can remember useless things like all of the lyrics to "What a Girl Wants" and not what I got off the couch and headed to the kitchen to do. Or maybe he did talk about that, and I just don't remember. Oh well, not for everyone I suppose. Glad you still enjoyed some of it. I read this book about 18 months ago and felt the exact same way. While the history of memory and the exercises were interesting, and applicable to my jr. high school student (the memory house); the rest of the story was pretty lame. I also thought the competition was ridiculous. I picked up this book in hopes for a few memory techniques to help my kids with studying for tests, since I was a huge failure in high school and college with remembering things. I still haven't found many good ideas except flash cards and we did use our house plan to help him remember items for a science final, but other than that I agree with your review completely! Do you have any other suggestions for books to help with memory techniques? We are starting high school this year! I have always wanted to be part of a book club but never had the chance, so I decided to join in on your summer reading adventure. I actually didn't finish this book because of the parts that were so slow. It was not a fun read. I have read the samples on my iPad of the books for July and August, and I have already been sucked in. I am excited for July to get here so I can start! I gave up on this book partway through. It just seemed like some guy trying to make some money by trying out some random experiment/lifestyle and then writing a book about it, which annoyed me. I do, however, occasionally try and associate a list of things to remember with objects in a room. My "mind palace" is more like a mind studio apartment, since the find the idea of mind palaces way to complicated. Ah, I thought I'd be the only one who didn't like this book. Whew. I couldn't even finish, and really, barely started. Just a couple chapters in and I was dreading picking it up again. I actually had to put this book down because I simply couldn't make it through the memory competition aspect of it. Such a shame. You know, it's funny because I had the same reaction as your did by the end of the book, "Wait, what?! You still have to use post it notes?! Then what is the point of this book?" But for some reason, it made me love the book even more! I like how it embraces the limitations of our brains, but leaves room for what it is capable of. I've actually been using the tricks he suggests for even ordinary things and I'm surprised at what I can remember! I'm sad you didn't like it! I had the same thoughts about the memory contests. But in the mental athletes' defense, I ask, what is the point of: a body building contest; a spelling bee; breaking any world record; curling; or cooking your way through Julia Child's recipes. The answer is: it is a challenge and we humans love a challenge. I liked hearing about the quirky mental athletes and was impressed by their dedication. What disappointed me was that I had hoped that I would learn some skills that would permanently make my memory better and my life easier. If you watch Foer's TED talk, he addresses this disappointment and argues that some things are better when they are more challenging rather than taking the shortcut. I really appreciate this comment, I think you've hit it in the head. What *is* the point? Trying something new, trying something difficult, sticking with it long enough to see improvement and measurable success, and then deciding whether our not to incorporate it into your daily life moving forward. Just because everyone doesn't love his experience our end result doesn't mean there is not value in attempting it. I read this review this morning and then thought about what you said about the OK plateau for the rest of the day! That alone makes me want to pick up the book, if only to read more about that concept. I agree. I got this book around Christmas and while I enjoyed parts of it, the book wasn't compelling enough for me to even actually finish it. I'm relieved to hear you didn't love the book, because I had a hard time just reading the first few chapters. I've kept it on my library book shelf (unread) just in case you could convince me to finish it. Confession, I accidentally cheated and first read the July book, Ruby Red, forgoing all household duties to read it in a day. And then I read the next in the series (also in a day). And now I realize my punishment for reading ahead is having to wait until October for the third and final book in the series. Oh, see, I actually really liked the part where he practiced for the championships (and found the history part disconnected and snooze-worthy). Yes, I agree, there was lots of drinking and carousing that seemed somewhat unnecessary, but the theme was that if you work hard at it, anyone can be moderately successful. I was comforted by the thought that if you work at something, you can do it. And I liked hearing how he approached it and trained. That's the beauty of books – we all take something different out of each one! So, I've been thinking about this a lot in the last few days. I tried to comment via my phone a while back, but ended up with technical issues and it didn't post (and my other comment posted twice…so…no phone comments). I think you have a point that Foer's experience itself is less than riveting and can be frustrating. I read this book a couple of years ago and don't recall any of the drinking or carousing or whathaveyou. I mostly remember the process and the history. I think there are a lot of non-fiction books of late that are a combination of someone's experience with a thing, and the history of that thing: Happiness (Gretchen Rubin); Exploring the Amazon (The Lost City of Z); Hiking Machu Picchu (Turn Right at Machu Picchu); cooking (Make the Bread, Buy the Butter); walking the Appalachian Trail (A Walk in the Woods); eating junk food (Supersize Me); eating good food (Omnivore's Dilemma)…the list goes on and on. For me, the point of all of these books isn't necessarily whether I agree with, am entertained by, or even appreciate the hard thing that the author is trying to do, but the fact that they are trying to do a hard thing is the important part. I think as humans we often shy away from hard things because, well, it's hard. But I also think there is something infinitely beneficial in sticking with a project for a certain period of time, or working hard towards a specific goal, or whatever it is. Anyway, this is probably a lot more philosophical a comment than you really were looking for, but there it is anyway.